'Diverging Diamond' Traffic Flow: Way Of The Future? The "diverging diamond" highway interchange is being put to the test in Missouri. Fans of the new design say it improves traffic flow by eliminating problematic left turns. There's just one catch: It briefly sends cars over to the left side of the road. 'Diverging Diamond' Traffic Flow: Way Of The Future? It's not often that you can make traffic flow more smoothly and safely without spending significant time and money. But drivers in Springfield, Mo., are the first in the United States to use a new interchange design that transportation officials say is quick, cheap, and safe. The "diverging diamond" is being put to the test. Fans of the new highway interchange design say it improves traffic flow by eliminating problematic left turns. There's just one catch: It briefly sends all cars over to the left side of the road. The Diamond Diverges: Cars swap sides of the road at the end of a bridge in Springfield, Mo. For some drivers, the new traffic pattern is just a little too weird. And even transportation official Don Saiko, who is a fan of the design, admits that it's tough to visualize. According to Saiko, a project manager with the Missouri Department of Transportation, "you crisscross at each end of the interchange" as traffic lights let one side go, then the other. When a driver on the four-lane Kansas Expressway reaches the interchange, his two-lane path goes over a bridge spanning the interstate. There are stoplights for north- and southbound traffic at both ends of the bridge. Passing through the first stoplight, traffic crosses over to the left side of the bridge. And at the stoplight on the other end of the bridge, cars cross back over to the right, returning everyone to the right side of the road. If you think it would feel a little strange to drive on the left side of the road, you're not alone. A new highway interchange design eliminates left turns at major intersections. "A lot of the older drivers are saying, 'This just ain't gonna work' and 'Where did they get this idea?' " said Faith Flanders, assistant manager at Gas Plus, a filling station near the interchange. "Some folks say, 'It's crazy. Why did they put it in? Wrecks gonna happen. Why did they do that to us?' "
Flanders says she gets an earful from drivers about the new design. But she likes it — she now spends much less time waiting in traffic. For one thing, drivers wanting to get on the interstate no longer have to wait for a left-turn signal: They simply veer off to the left as they cross the bridge and head down the ramp. Improved traffic flow is a key selling point of the new design — and so is cost. Saiko says that's because the change doesn't require much new construction. "We're using the existing bridge, didn't have to replace the bridge, so that's a huge savings," Saiko said. "If we would've had to replace the bridge, it would have been around $10 million — and this project was just around $3 [million]." If time is money, consider that it took less than half a year to build the new interchange in Missouri. With traditional designs, construction can drag on for two years. As for safety, Michael Trentacoste of the Federal Highway Administration says the diverging diamond interchanges are safer. "From a safety standpoint, we knew there would be less conflict points," Trentacoste said. "You have traffic that wasn't going to be crossing in front of oncoming traffic, because traffic is moved to the left." The idea is to make this interchange safer and improve traffic flow by eliminating the need for left-turn signals that hold up oncoming traffic. So, you might ask, if the diverging diamond interchange design is such a great solution, why did it take so long for one to get built? After all, France has used the design since the 1970s. Saiko says it's all about perception. It just seemed risky to have drivers go to the left as they cross a bridge. "Nobody wanted to be first," Saiko said. Nobody wanted to try it with the public. They didn't think they would accept it. "But we took it to our public meetings. They saw the animation of how it would work and you could see people saying, 'Hey. This is going to work.' 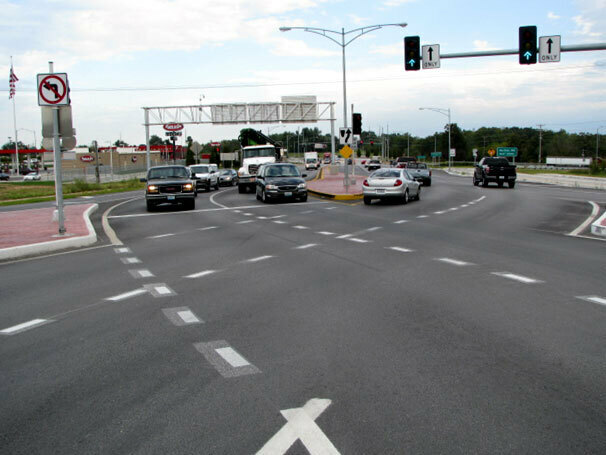 "
Construction on more diverging diamond interchanges is getting under way in Missouri. Trentacoste says that other cash-strapped states are paying attention. "The other states are going to be looking at the results," Trentacoste said, "and I think you're going to start seeing these be a preferred design in many locations." As the design becomes more common, more drivers will know what to expect. Hopefully, there will be less grumbling about how weird it is to drive, for a short time, on what feels like the wrong side of the road.